Have a domain but looking for the perfect theme to quickly get online? Want an elegant layout and design? Well look no further because QuickStart is built just for you. Using the theme options panel, you can set the featured slider to retrieve either the most recent posts, posts based on category or based on a specific user-defined tag. Another cool feature of featured slider is automatic rotation. You’ve seen it on our newspaper themes, and we implemented it into QuickStart. Now you have a built-in inner-page slider to scroll through multiple images within a post. The featured slider supports any of your videos whether they are hosted on YouTube, Vimeo, or on your server. This includes videos within the featured slider as well as your posts. Unlike other standard blogs, we’ve implemented enough content areas to ensure your site gets noticed. The amazing design lends itself to a clean and organized layout. QuickStart includes an advertisement module along with a “category based ad” option. With this module you can display categ0ry-specific advertisements – something not found in your standard themes. With 9 widget areas, you’ll have the flexibility to customize QuickStart to look and feel exactly the way you want. There’s also separate widget areas for your inner page sidebar. 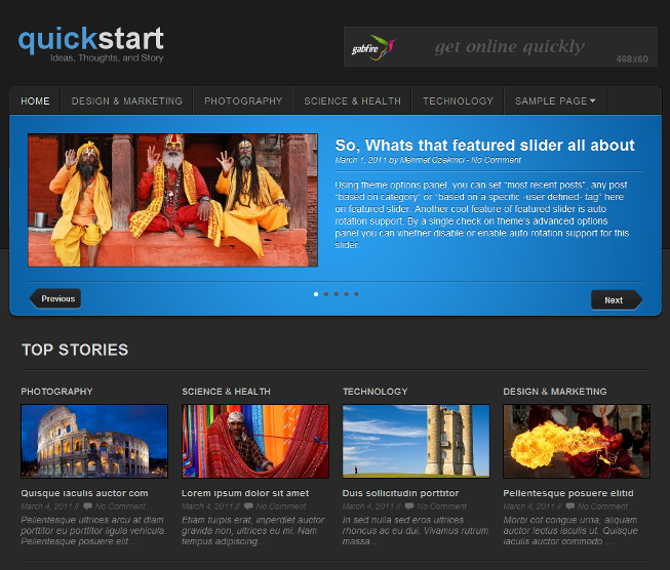 Quickstart is a semantic, HTML5 theme built using the latest coding standards. There are dozens of theme options to modify the site. Most importantly, you can expect the same level of thought-work put into the QuickStart back-end as any of our other Gabfire themes. Grab your copy today or check out the demo. Tell us what you think of this latest theme in the comments below or on the support forum? 13 Responses to "QuickStart Your Site with This WordPress Theme"
This is fantastic! I love this feature. Everyone has to get a Gabfire theme….they are so easy to use and customer service is fantastic! Hi, another great magazine / newspaper theme from gabfire. But are you planning to make themes other than that? Absolut fantastic themes, in terms of magazine like WP themes you are well ahead all of your competitors. I've got two websites with Newspaper look and I can assure you I have done some research to find the most attractive themes for online magazines and newspaper sites; I think there are some other designers out there that do some good job but Gabfire is by far the best. If there is no doubt JA Teline 4 is the best available template for Joomla it is difficult to pick up a winner for a WordPress powered website from one of your templates. I might consider to join the club if you think you'll release at least 3 themes / 2 months. What about a business like WP theme? HI Taranul – thanks for the compliments. It's great to hear we're doing things right! And in regards to your request for a business like WP theme, we have been developing one and you will see that coming in the near future. Its great that your using HTML5 on your themes … Great job!! it is necessary to “height:198px;”. Please try to increase height for .featured-slider as well. You published this theme 6 years ago…. Is it compatible with the latest WordPress?